The high cam engine is a fine piece of 1950s design. In its day an advanced, if idiosyncratic, piece of engineering. Many are happy to rebuild the engines as they were designed & manufactured. That’s fine by me & indeed I’ve done so myself. However, I’ve also used the bikes fairly extensively & can appreciate that improvements to both rideability & reliability can be made without making irreversible changes to the original equipment. Add to that fact the other thing I get asked regularly “How do I assemble the ….” & you will see why I’ve decided to add an “engine rebuild” section to the website. For some reason, I’m rarely asked “How do I get the …..off”. It seems we have no trouble dismantling it’s the mantling that foxes us! That may explain the hundreds of basket case bikes on eBay every week? 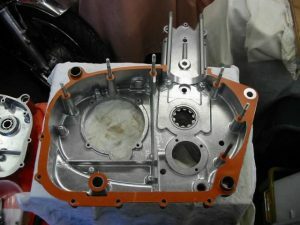 It covers the rebuild of a 250 Wildcat engine from the cases up with a variety of “mods” incorporated on the way. It’s a disjointed out-of-sequence account so don’t work through doing whatever I say in paragraph one before reading paragraphs 2,3,4,& 5. At some point soon I’ll be assembling a standard 250 engine with OE clutch, chain cam drive etc & I’ll add subsections to cover these items alongside the modified units used in this rebuild. Usual disclaimer – this is the way I do it & am happy with. I make no claims that doing it this way is the correct way or the best way or will guarantee that your engine will work when finished. So don’t come whingeing if your fat fingers, lack of expertise or any inadvertent mistakes in the text you slavishly follow ends you up with a smouldering wreck! Gasket in place & trimmed after being clamped tight overnight. It’s up to you what level of finish you want on your cases. I’m happy with solvent cleaning alone. A bit of patina remains – that’s OK with me. No blasting with the Devils glass beads for me! A recently discovered alternative is “Vibro cleaning” where the cases are gently jiggled in a liquid bath filled with small metal & ceramic spheres. Delivers a lovely burnished finish which is the nearest I’ve seen to a new casting. First job for me is to deburr the cases & radius the drillings with a hand held woodworkers countersink. Threaded holes in alloy always lift when pulled by a screw or stud & this raised circumference can lead to bad gasket seating with the case halves effectively being held apart. 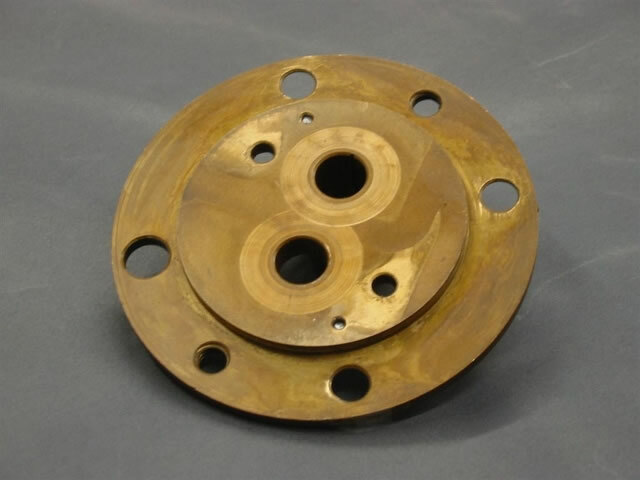 In the Parilla engine the gaskets are structural i.e they are designed with an engineering function. In effect they are shims. In doubt? 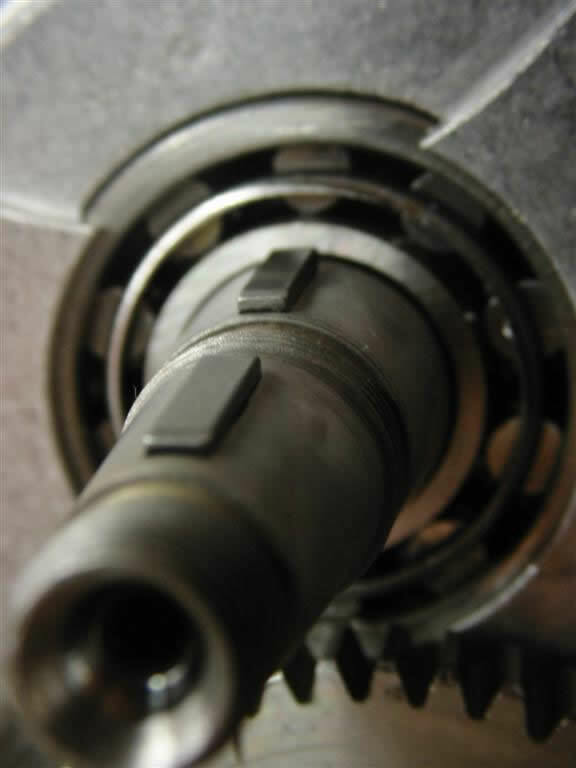 Look at the gearbox bearing plate or “cassette” in which the shafts & selection mechanism reside. It has a gasket between it & the crankcase. Why when there is the same reservoir of oil lapping on both sides of it? To provide end float on the shafts. There are no shims other than that seemingly redundant gasket. 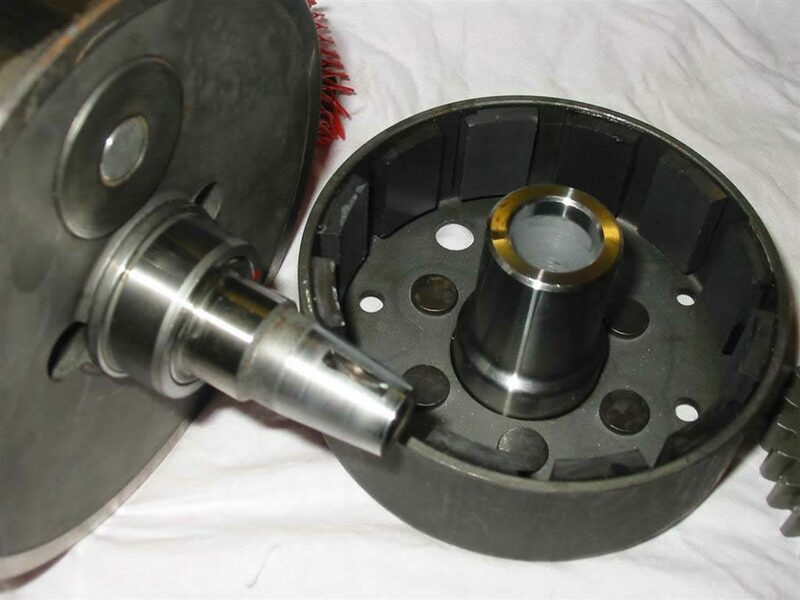 The spindle for the lower cam chain “double gear” is best fitted before joining the cases as it is just below the level of the crankcase mouth. Next, I fit the main & gearbox bearings into the pristine crankcase halves. Heated to 180C in our kitchen oven the cases will accept the bearings (cooled in the freezer for a couple of hours) very easily – they literally drop in. A smear of Loctite bearing fit on the outer race prevents it turning. Most used cases I’ve seen bear witness to spinning outer races – a shiny band on the alloy of the bearing seat & outer race. The choice of bearing fit is a thorny one. 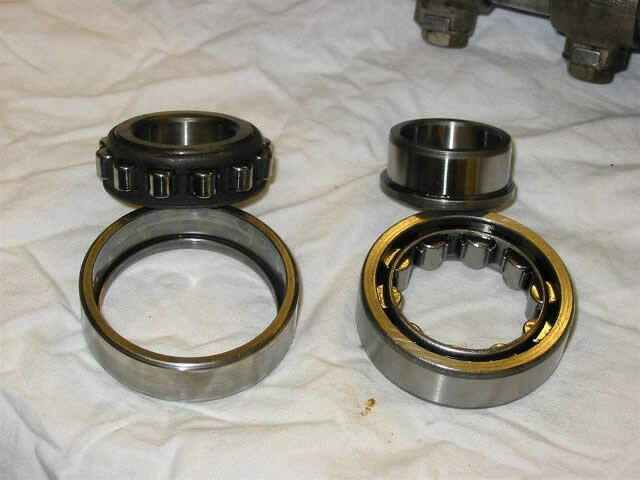 A bearing which has its outer race compressed by a “shrink fit” alloy case & its inner expanded by a “drive fit” onto a shaft has less internal clearance than when it came out of its packet. 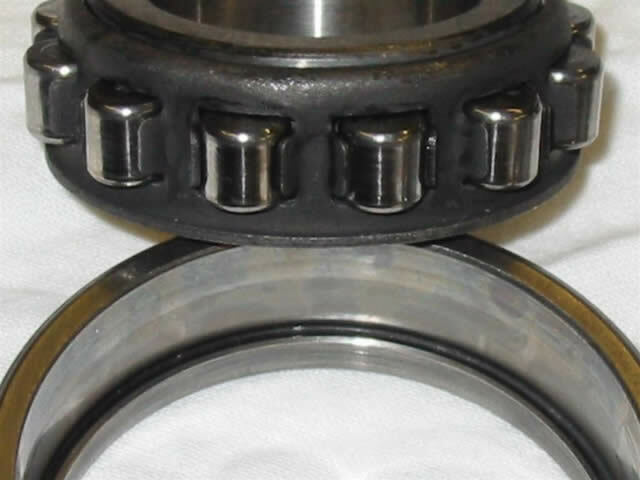 For this reason, the OE bearings are of greater internal clearance, “C3”, than normal. So what do you fit when the outer & inner on your engine have both spun in the cases/on the crank & drop out/off when you split the cases? No compression or expansion there! It’s a gamble to fit a standard clearance bearing & the fact they are cheaper is little consolation if they wear out in a few thousand miles. I stick with C3 where specified. With the 205 series roller main bearings, you have the choice of the rollers being held captive on the inner or outer race. The OEs were held on the inner race. I prefer those held on the outer. In my experience, it’s very rare to shim the outer race away from the cases to establish correct crank end float. Heating the cases to remove the outers & drop in shims is a lot of trouble. It’s more common to shim the inner races away from the crank. To do this just requires the inner to be pulled off (or slid) & that’s a lot easier if you haven’t got a set of rollers attached to it! The standard setup for main bearings is two sets of 205 rollers. It’s also possible to use 6205 ball bearings instead. Dimensionally exactly the same but with lower load rating & drag. Not a setup for high mileage but it’s what some of the factory race bikes used. Far cheaper than the rollers & just how many miles does the average Parilla owner put on his engine these days? As you can imagine having a non-detachable inner race has implications for fitting & crank endfloat setting. Not a mod I’ve got round to doing so far. A final note on bearing choice. As well as a choice of roller retention 205 roller bearings can be lipless or lipped. The lip is what limits the endfloat of the crank so use that variety. So I’ve got cases with bearings in & the next stage is to set crank endfloat. First thing to do is to stick the centre gasket to one of the case sides. I prefer to use the drive side which houses the studs for bolting the cases together. 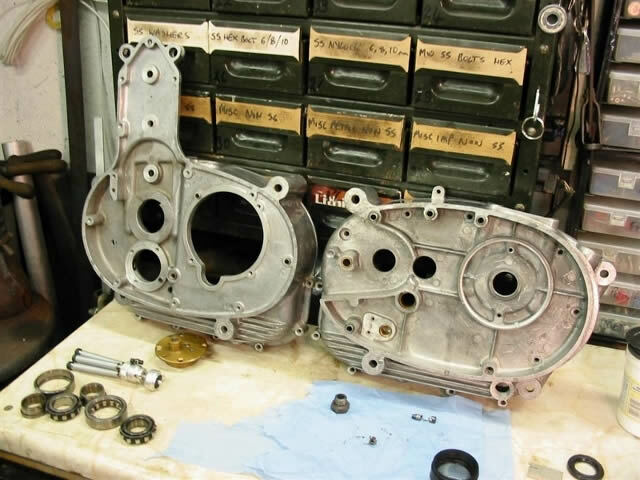 You will be dismantling the cases several times in order to set crank end float & if the gasket is on the other side you stand the chance of damaging it or pulling it off as the studs exit the bolt holes. 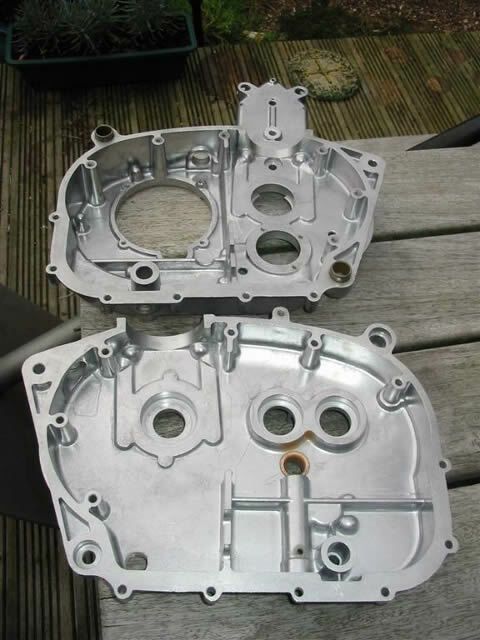 Before gooing the gasket in place (Hylomar or Wellseal being my choice) you might like to try fitting the cases, with studs & dowels fitted, together & check they come together precisely & separate cleanly without need to resort to hammers & chisels. I now bolt up the cases overnight to fix & compress the gasket. 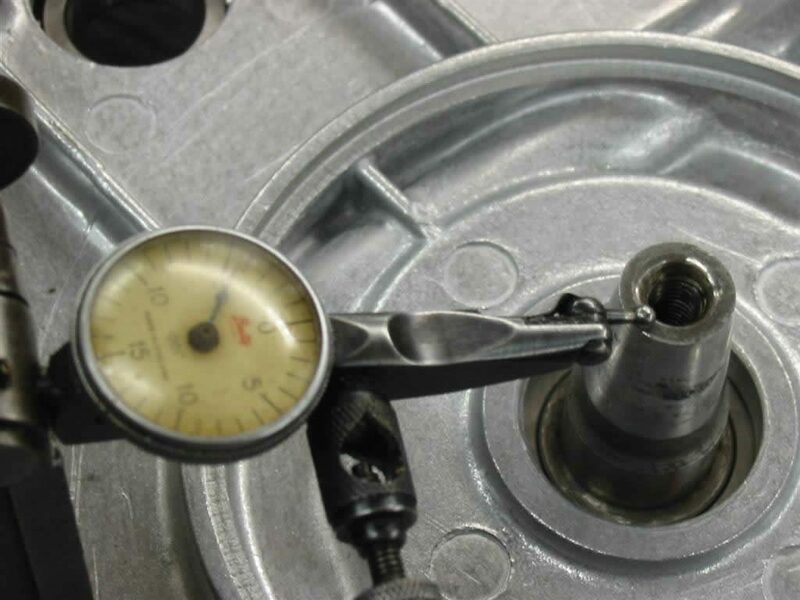 This ensures an accurate endfloat figure can be arrived at which wont be affected by the gasket “giving” when the crankcase studs & bolts are finally tightened. If the endfloat needs adjustment shims will be needed behind the bearing inners. I’ve never had “tight” cases as I ensure the crank is rebuilt accurately to the 66.20mm dimensions given in the workshop manual. This ensures a slightly “loose” crank at worst which will need a few thou of shims to get the endfloat correct. Some would say shims should be added equally to both sides but I prefer to let rod centrality dictate which side should be shimmed or the distribution proportions right & left. The first trial fitting of the crank will not only reveal the end float correction required but also where the shims should be. There is no need to assemble the gearbox prior to the cases closing for the last time. The gear cluster & selector mechanism can be offered up assembled to the outer box cover. An idea copied by Japan many years later – the “cassette” box was seen as a great innovation enabling gear ratios on race bikes to be changed at the trackside without splitting the crankcases. Not a facility needed on a Parilla but it is an advantage when rebuilding. 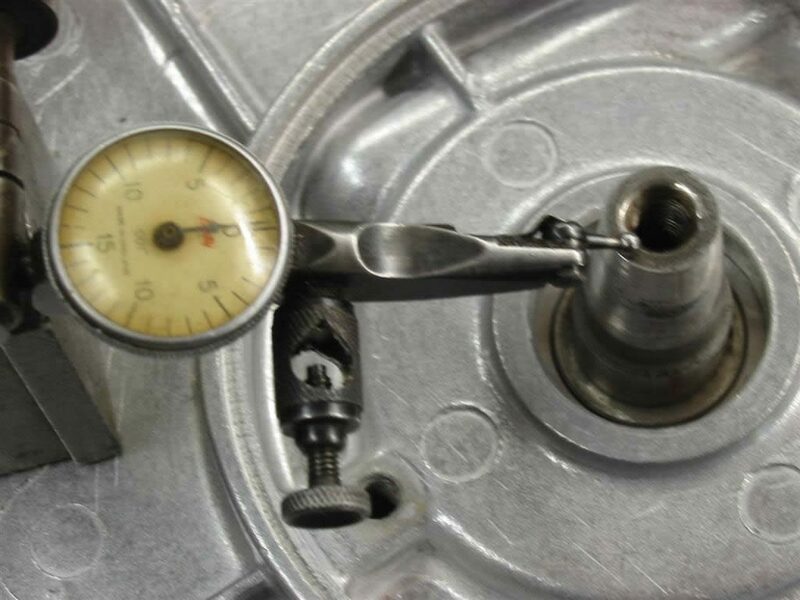 A word about tapers….I always “lap-in” all the tapers on the crank & layshaft before assembling them into the engine. Depending on the condition of the shaft/sprocket/gear a light lap with a slightly abrasive metal polish (Solvol autosol being a UK favourite) or a more determined grind in with fine valve seat paste may be required. There are two tapers in the drivetrain to the back wheel & both need to be in 100% contact to ensure snag free motion. 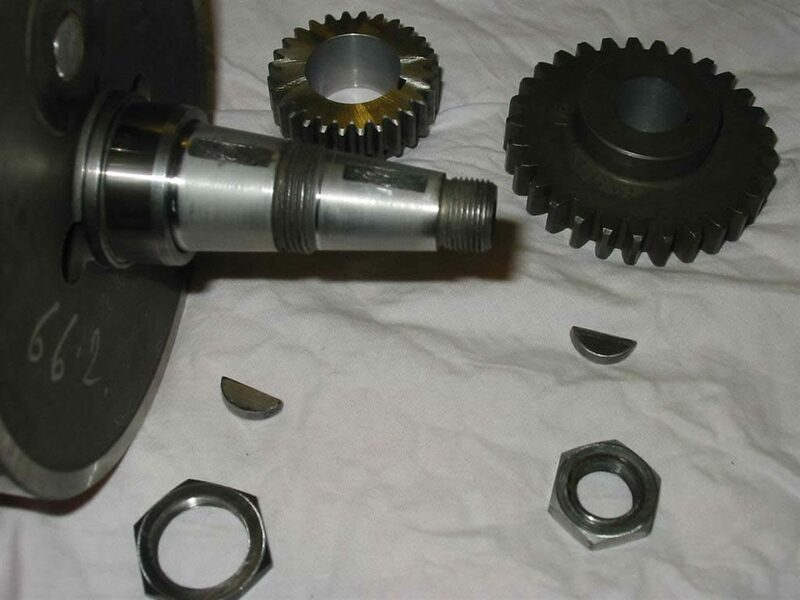 I’ve seen several sheared woodruff keys in gearbox sprockets & mangled tapers as a result. It’s worthwhile taking the time to get a good mating of shaft & sprocket early in the rebuild. Anyone who has struggled to get off a gearbox sprocket or mainshaft drive pinion will know exactly how good a joint a well fitting taper is. The “crack” as it gives way is one of the most satisfying noises I know of – always followed by a grateful “phew” from yours truly! Its best to replace a worn woodruff key.Sizes used in the Moto Parilla engine are mostly standard engineering sizes. So we now have a set of cases with a shimmed up crank in place, tapers ground & new keys in place. If you have taken the oil pump out, through idle curiosity, the desire to refurbish or upgrade it (see oil pump section of this page) or just so as it doesn’t end up full of whatever sort of evil brew the chap who cleans up cases uses then now’s a good time to put it back. The pump is a light shrink fit in the cases. In many cases it just drops back into the room temperature cases with a tap other times a little heat up of the cases locally will be required along with putting the pump in the freezer for an hour or so. If you are a quick mover you can drop it in at the same time as you introduce the new main bearings. I don’t bother as the hole where it fits is a handy access point for my wooden fitters hammer handle when I want to separate the cases during the endfloat setting sessions. Once the pump fitting is completed the cases can be bolted together. High-tech thermal lance employed to warm Parilla cases. 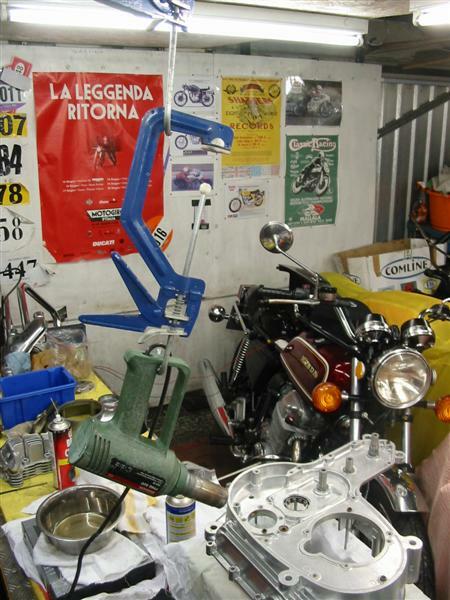 Note nasty Japanese machine lurking in the background. 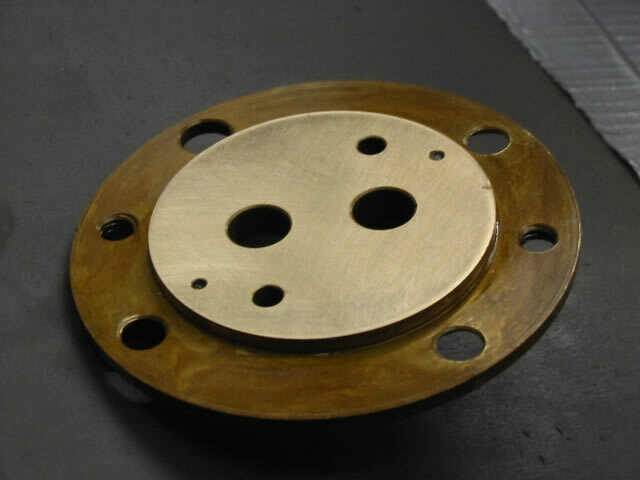 The oil pump itself can be dismantled & some wear eliminated to maximise its pumping efficiency. 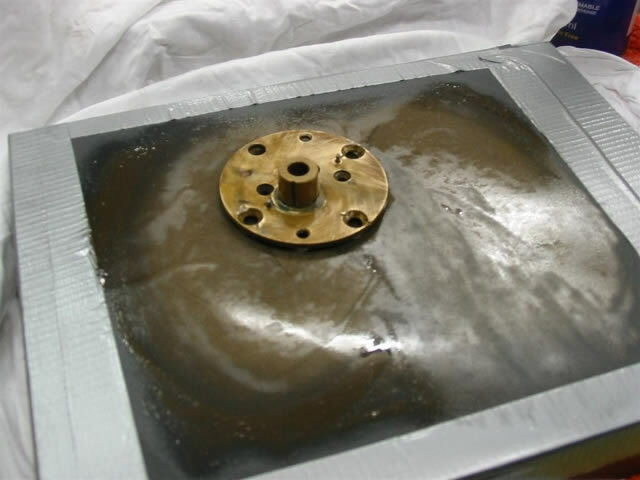 As a bronze bodied item with a flat cover plate over the two steel supply gears, the entirety of which is submerged in oil, one would not suspect a great deal of wear could take place. In reality, the gears are free to float laterally & the oil strainer (I will not dignify it with the term “filter”) lets through quite large particles of abrasive material from the inevitable wear Witness marks left by gear wear in the oil pump taking place elsewhere in the engine & gearbox. Trapped between gears and pump body or cover they grind away & provide unwanted clearance which gives the oil an easier escape route than taking the official exit to the timing cover, crank, cam & valve gear. I’ve witnessed a pump so worn that the oil couldn’t make it up to the bottom union of the oil T feed to the head with the engine running. Tape or otherwise affix the abrasive paper to the surface plate ensuring no wrinkles are allowed to form. I use a cheapo Chinese granite plate & expensive 3M paper which won’t disintegrate in use. Oil the paper with a thin machine oil or similar lubricant (I use WD40) & move the cover plate in a figure 8 motion for a few rotations. Reverse the action for a few more rotations, remove & clean off both workpiece & abrasive surface. Slowly the witness marks left by the gears eating into the plate will be eased away & finally disappear. A similar job can be done to the body but in this case, the wear remains evident & the body is reduced in depth to take up the play – hence my claim to minimise rather than eliminate the wear. Care must be taken to keep everything square to the plate & ensure that too much isn’t removed from the body of the pump thus making the gears too tight or in an extreme case stopping the cover plate seating properly & seizing up the pump altogether. NOTE: If you do decide to refurbish the pump be sure to scribe a line across the cover/body joint before taking it apart and realign the marks on assembly. It is possible to assemble the pump body & cover 180 degrees out which will result in no output from the pump and a wrecked engine.